IMPERIA COLLEGE (Previously known as IMPERIA COLLEGE OF HOSPITALITY) or ICH was established in 2011 relatively new but the company has been around for more than ten years and successfully providing hospitality skills to more than one thousand students. The college prides itself on the team of professional Instructors and friendly administration staff understanding their education needs and wants; providing career guidance and advice; what’s more and unique the college is located in an actual operational hotel; Bukit Gambang Resort City (www.bgrc.com.my) a prominent and outstanding environment at which students can learn more about hospitality and tourism in actual. We have high expectations in our students. They are expected to be competent of both theoretical and practical knowledge and ready for the industry, hence IMPERIA is located in a hotel with a true hotel environment. Every area either it is Food & Beverage services, accommodation practices, reception techniques, bakery and pastry, kitchen practices complements each other in the culinary world and students will be able to apply their knowledge and skills in creating their own distinctive styles. Welcome to IMPERIA COLLEGE (ICH), Malaysia’s premier institution in providing knowledge and skills in Hospitality and Tourism Education. The education and training you are about to undergo at ICH will give you a head start in the fast growing hospitality and tourism industry by moulding you into a competent and skilled professional. You are given an opportunity for a permanent employment at our group of companies namely Bukit Gambang Resort City and other new resort cities in Langkawi, Morib and Kuching upon successfully completion of your study at ICH. The training you shall receive at the college will also help you cope with the pressures and demands of every practical aspect of the industry. However, your lectures alone cannot help you accomplish all of it. You must possess the initiative and willingness to learn. The thirst for knowledge and skills, the right attitude, coupled with an ambition to be the best must drive you towards attaining a high standard of performance. Our interesting teaching and learning such as work-based learning will give you a new dimension in attaining the skills and knowledge in hospitality more meaningful and hopefully for you to “master” them. Not withstanding the pressure of your coursework, there is still room for extracurricular activities in games and social activities organized by the Student Body Council. We want to be proud of you and we want you to take pride in your college. WELCOME AND GOOD LUCK! IMPERIA College (ICH) is more focus and specify at Diploma and Certificate level in hospitality from Culinary Arts, Hotel Management, Tourism Management, Event & Entertainment Management to exciting Theme Park & Attractions Management. The uniqueness and the quality of the program with a concept of “From Industry To Industry” will give an edge to ICH students of exciting teaching and learning. 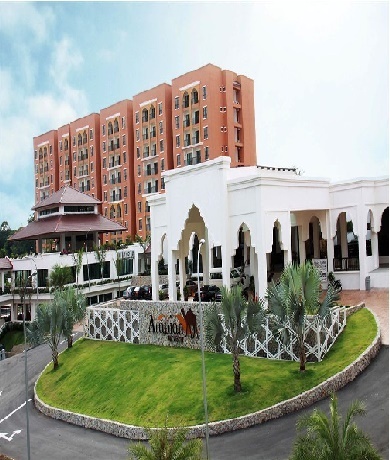 With this and most likely the only private college in Pahang that offers a full pledge of culinary arts program and residing in its own resort or hotel. The hospitality and tourism program at ICH has a dual objective. It offers a solid basic knowledge and skills required for learning in the selected field, but ICH program also offers the basic practical in the field to expose the students in the career of hospitality, culinary arts and tourism. Students will be exposed in the field beyond the classroom situation with the actual practical required in the industry. The theory of teaching and learning is equipped with the practical to ensure the students understand and fit in the actual industry. The program in ICH is to mould the students to be “industry-ready”, so they will be ready to face the actual scenario in the industry. ICH strong linkages with the industry enable the students to gain the knowledge and experience the working environment even before they complete the program in ICH. The industrial training is a must to the ICH students and is planned and arranged properly by ICH, whats more in the second year student will undergo a work-based learning at which students are exposed directly at an operational hotels, resort, theme park or other park such as nature park. Students are also exposed in the industry with the talk by the experience personnel from the industry to share their experience. Our unique Diploma in Resort Management is 2 years full work base learning diploma program, exciting and fun learning that’s the expectation from students. ICH provides the solid basic and actual skill to the students in preparing them for their future career or even learning or study. Every Diploma programs at ICH is only for 2.5 years and at a very affordable cost whereby the local student can fund it fully through PTPTN or even the local financial institute such as bank or even EPF. The whole learning duration with ICH, students will be provided with English communication skills and the practical skills that meet the industry requirement. Students also expose to the charity and community work in developing a productive worker with a high value of learning and responsibility to the work place and community. IMPERIA College does not discriminate students and employment of any backgrounds; nationality, race, religion or gender or even their physical appearance. IMPERIA is a college that emphasize on industry relevancy and competency, thus ICH’s academic team and staffs have had years of academic and industry experience which they bring into the classroom. This enable them to relay the knowledge and share the actual experience in the industry. ICH Board of Academic comprises experience top management from the industry to share and advise on ICH curriculum development and delivery to meet the industry recent requirements. IMPERIA COLLEGE is an approved local private higher education by Ministry of Higher Education (MoHE) Malaysia. ICH programmes are accredited by both Malaysia Qualification Agency (MQA) and MoHE. ICH will always strive for a quality in its delivering the skills knowledge for producing the best talent in the industry and at the same time will be partnering with academic institution of higher education in building up ICH credibility and return set a higher standard graduates. If you think you got what it takes to change, groom and educate our youth today to deliver the best hospitality services and change the customer service level in Malaysia….